Previous post: 10 photos to sum up our Abel-Tasman experience. 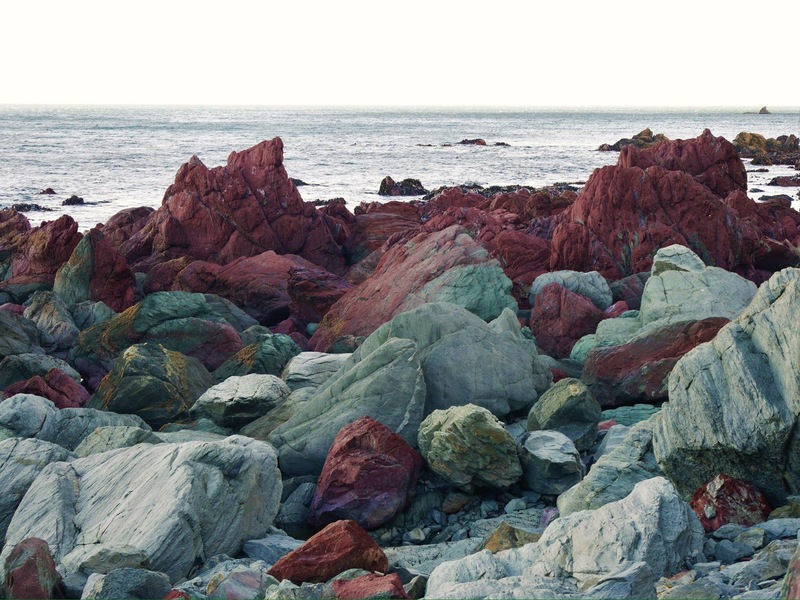 “Maori folklore tells two stories relating to the color of these rocks. In one, Kupe – the famous Polynesian explorer – was gathering Paua ( large edible sea snails ) here when one clamped his hand. He bled and stained the rocks red. The Red Rocks Reserve is a coastal walkway located at Owhiro Bay, Wellington NZ. It generally takes about two hours ( return ) to do the walk. About 30-40 minutes going to where the red rocks are and then another 30 minutes to continue on a bit further to Sinclair Head to get a glimpse of the New Zealand fur seal colony. Then an hours walk to go all the way back to where you started. Although I think the time it takes to do the walk will really be different for everyone. Some may do it faster than others… it really depends on how physically fit you are and what pace you are aiming at. RUGGED TERRAIN — You’ll be walking on sand and stones. Make sure to wear appropriate footwear like sneakers ( or rubber shoes ). Wear comfortable clothing as well. BEAUTIFUL VIEWS — You could easily get pre-occupied with just doing the walk and finishing it. When it gets a bit tiring, take a breather, look around and appreciate what’s around you. MILD TO STRONG WINDS (It IS Wellington after all) — A windproof hoodie with good insulation is a good accessory to have as it can get really windy and cold in the late afternoon (especially if you’re doing the walk in winter). When we did our walk, the wind was strong enough to actually blast some of the sand and pebbles on the side of our faces! GOOD EXERCISE — Red Rocks is considered as an easy walk… still, that’s about two hours of proper walking… that’s good exercise if you ask me. You could always jog or run as well if that’s more suited to your activity level. Within the area is also where the Taputeranga Marine Reserve is located where you can go snorkelling or diving. See here for more information http://www.doc.govt.nz/Documents/conservation/marine-and-coastal/marine-protected-areas/taputeranga-marine-reserve-brochure.pdf. THE SEALS — Generally the seals are just lying and resting on top of the rocks and are harmless. Be cautious in approaching them though and don’t get TOO close. I got one of the seals all flustered and roaring at me when I got too close for comfort. That was quite a scare. Drive: It’s about 25 minutes drive from the city center down to Owhiro Bay.